In the 1970s, the Housing Construction Promotion Act was enacted to increase the housing supply. Scholars say this is the beginning of the apartment age. The Housing Construction Promotion Act allowed the housing market to be revitalised and as a result the amount of housing increased exponentially. It simply focused on increasing the amount of housing and did not try to improve the underdeveloped housing environment. Later, in order to plan for the scarcity of parking lots and residents’ facilities in the low-rise residential area, a region with the poor residential environment was selected, and a large-scale demolition system, redevelopment and new town project were carried out. However, due to the deterioration of business performance and serious conflicts among the residents, many areas have recently been removed from the designated redevelopment and reconstruction (planned) areas nationwide. Of these, Act on Special Cases Concerning Empty Houses and Small House Maintenance (hereinafter Small House Maintenance Act) was enforced last Feb. It plans to actively use vacant houses that have grown due to population decline and improve infrastructure that cannot be solved individually by developing small (less than 20 households) blocks or medium-sized (less than 200 households) villages. 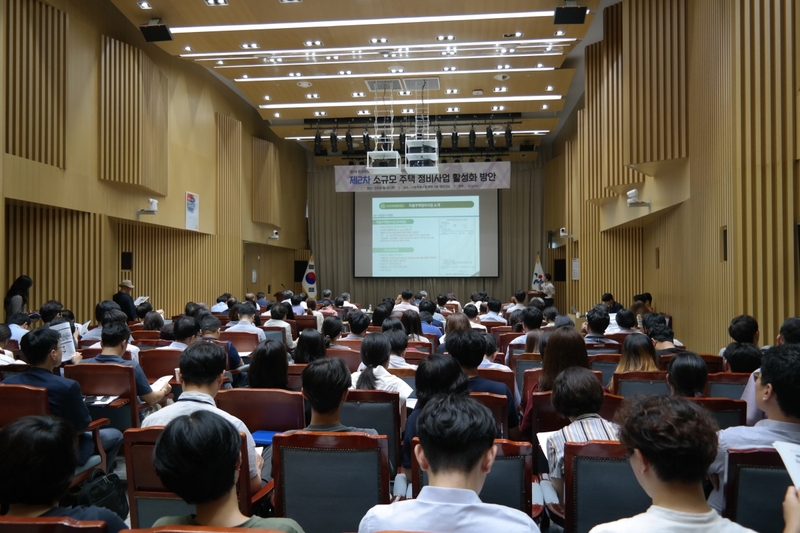 The Seoul Metropolitan Government (SMG) will hold a symposium on low-rise residential areas four times in spring, summer, autumn, and winter, in order to discuss ways to revitalize outdated low-rise residential areas, develop policy ideas, and form a consensus among citizens. At the second symposium held on Aug. 30, the theme was ‘Activation of Small-Scale Housing Maintenance’. The symposium is designed to kick-start the small-scale housing development project as a new residential renewal model that can improve the residential environment while maintaining the urban structure of existing low-rise residential areas. Cho Junbae (director, Seoul Housing & Communities Corporation) presented the empty house maintenance project, a small-scale housing development project, and how support for business revitalisation the Seoul Housing & Communities Corporation (SH) has been working. Seo Yongsik (principal, Soomok design group) introduced the unit-type, block-type town development conducted by the private sector. Following the keynotes, Kim Sung Hong (professor, University of Seoul) led the discussion with Nam Jin (professor, University of Seoul), Jang Namjong (research fellow, The Seoul Institute), Lee Kwanghwan (principal, HAEAHN Architecture) and Lee Kyungsun (member, City Planning & Management Committee, Seoul Metropolitan Council). Kim Sung Hong said, ‘there are not many cases of realising small-scale housing development projects in SH or the private sector. According to the preparatory conditions, it is possible to cause conflict between regions.’ Lee Kwanghwan pointed out that the master plan for village infrastructure, which is difficult to implement in the private sector, should be publicly established. Discussants such as Nam Jin and Jang Namjong expressed the opinions that it is important to investigate the actual condition of vacant houses or the falling behind of settlements, in order to grasp the current situation.